Imagine a dystopian future where citizens are forced to live in a virtual reality just to escape the unsettling state of the present. Narrated by actor Will Wheaton, this thrilling story is a fast-paced adventure that pits thousands of desperate members of humanity against each other in the ultimate race for the winning prize. It's the year 2044, and the real world has become an ugly place. We're out of oil. We've wrecked the climate. Famine, poverty, and disease are widespread. Like most of humanity, Wade Watts escapes this depressing reality by spending his waking hours jacked into the OASIS, a sprawling virtual utopia where you can be anything you want to be, where you can live and play and fall in love on any of ten thousand planets. And, like most of humanity, Wade is obsessed by the ultimate lottery ticket that lies concealed within this alternate reality: OASIS founder James Halliday, who died with no heir, has promised that control of the OASIS - and his massive fortune - will go to the person who can solve the riddles he has left scattered throughout his creation. For years, millions have struggled fruitlessly to attain this prize, knowing only that the riddles are based in the culture of the late 20th century. And then Wade stumbles onto the key to the first puzzle. Suddenly he finds himself pitted against thousands of competitors in a desperate race to claim the ultimate prize, a chase that soon takes on terrifying real-world dimensions - and that will leave both Wade and his world profoundly changed. Narrator Wil Wheaton is an American actor and writer best known for his role as Wesley Crusher in the TV series Star Trek: The Next Generation, and for playing Gordie Lachance in the film Stand By Me. More recently, he has appeared in several episodes of the TV series The Big Bang Theory as himself. Couple of years back I read and loved (in fact here's my review here) of Ready Player One, I adored it from the get go. A dystopian future with a great big dollop of 80's nostalgia with 90 percent of it being played out in a virtual universe. 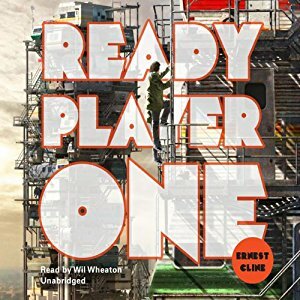 Of late I never really get a chance to re-read books but thanks to some Audible credits I had, I decided to listen to Ready Player One which is narrated by the wonderful Wil Wheaton. It sounds brilliant, Wil is perfect at injecting life in to this wonderful book, he really grabs the listener you know, I've listened to other audiobooks before where I've found the narrator to be dull but Wil is great and this audiobook you could quite happily lose hours in it as Wil takes us on Wade's journey to find the holy grail of Halliday's hidden treasure beautifully describing the virtual OASIS and the reality of Wade's urban hell. The film is due out next year so make sure you read before then!! Nothing but the sweet tones of Wil Wheaton's voice! You can almost hear them though!! He's the best and he really does a great job of doing this one. It was a fantastic listen, gave me goosebumps!